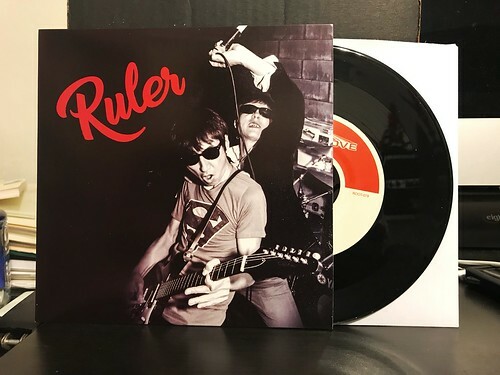 I Buy Way Too Many Records Dot Com: Ruler - Tiger 7"
Ruler is a new band featuring Fink. You may already know Fink as he was in Teengenerate. I, of course, know Teengenerate first from their split 7" with Bum. That 7" has some of my favorite artwork ever. Good tunes as well. Back to Ruler. They are playing the kind of fast buzzsaw punk rock that Fink has always made his calling card. Equal parts timeless and stuck in the 70s, "Tiger" hits all the marks you'd expect of this kind of song. Savage riffs and howling vocals that peak to a singalong chorus. "Gimme Some Noise" starts off with a lead guitar riff that sounds like the theme music to The Munsters, but quickly starts chugging along. Everything builds until it hits the chorus, complete with 50s style callbacks. Both songs are totally fine and I'd even go so far as to say pretty good, but neither song is anything that new or particularly exciting. Still, there's something to be said for nice, consistent punk rock. Fink plays guitar in Ruler. Otoya from Intimate Fags is the singer.